for less than $100 in under 15 min. If you have issues scheduling please utilize the LIVE CHAT feature on the bottom left-hand corner. We are more than happy to help! *NOTE* We only schedule in 5 min slots. Training is typically 5-10 min, the whole process is about 15 min, and yes, that is enough time! All current availability is listed on the calendar here! Choose the appointment type. If it's THE DOG's first time choose "First Time" if it's THE DOG's refresher choose "Refresher." If you have multiple refreshers or multiple first-timers those dogs must be booked together. Simply click the first time then click "Add a Time..." Then click the following time and so forth until all pups are booked! If you have a FIRST-TIMER and a REFRESHER please make two different appointments. Please try to select the first available time to help us manage large gaps! For multiple dogs, please choose consecutive times. If there aren't any 2+ times available, please select another date. Fill out you and your dog's info, and pay! Cancellation Policy: You may cancel or reschedule your session up to 48 hours in advance. We do not allow refunds after scheduling, but we will credit to your account for future use of any programs with us. We apologize for any inconvenience and thank you for supporting a local, family-owned business. why should you train your dog to avoid rattlesnakes? Training a dog to avoid Rattlesnakes costs less than $100. However, if your dog is bit, medical bills can be upwards of $3,000. Rattlesnake bites are extremely painful and could lead to death even AFTER treatment. A few minutes of training could avoid all of that. 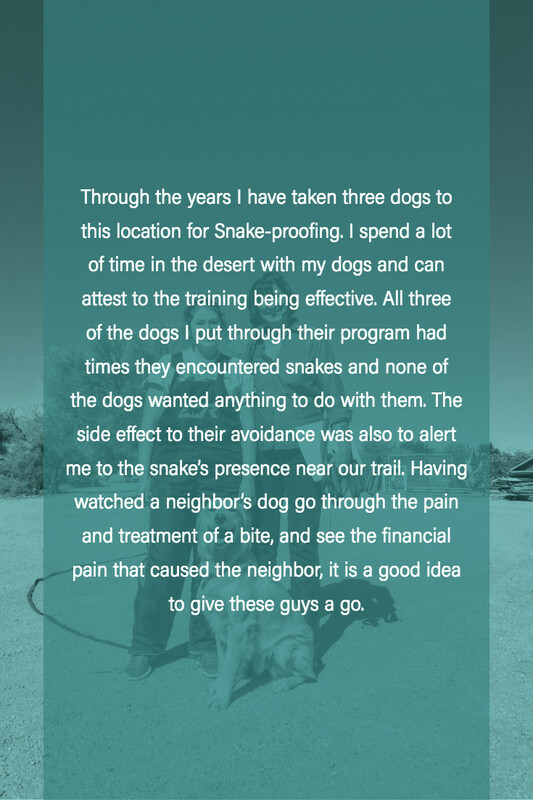 Time and time again, we have had clients say if their dog didn’t alert them to a Rattlesnake nearby, they would have stepped on it themselves. What is partners snake avoidance? At Partners Snake Avoidance, we train a negative association to the scent and sound of a rattlesnake using a small “nick” on an e-collar. That subsequently trains your dog to run away whenever he/she recognizes the scent or sound of a rattlesnake. “After training, our first occasionally ran into snakes on trails, and would not approach them at all. She often let us know there was a snake up ahead, before we knew it ourselves. It’s a must for dog owners who love their fur babies!”- Karen B. 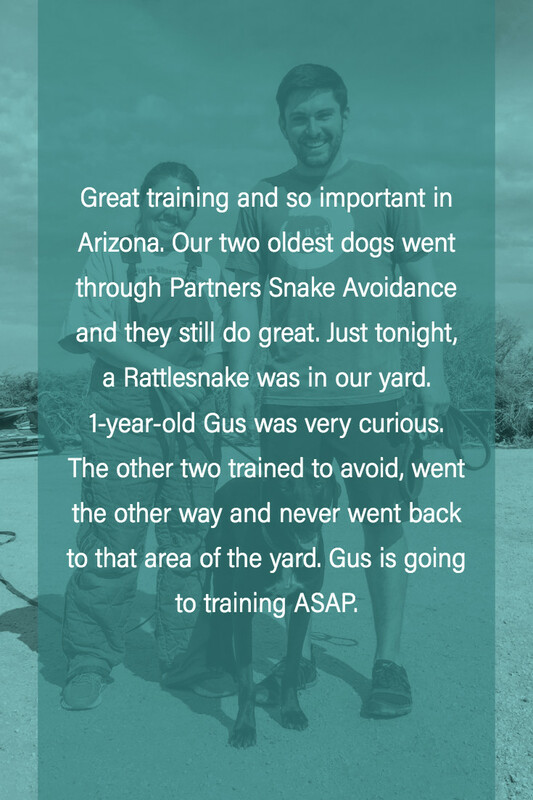 We are one of the first dog schools to ever do Rattlesnake Avoidance Training. Since the beginning, we have trained over 16,000 dogs to avoid rattlesnakes. We pass that experience onto you and ensure that every dog is trained to the best of our ability. “We have 2 dogs who were trained by Partners for Snake Avoidance. 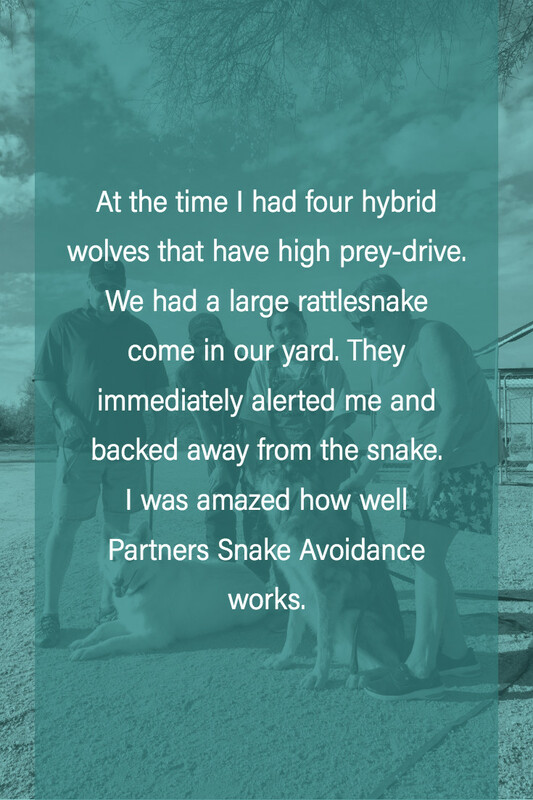 It was done quickly and with no discomfort to our pups.” -Paul K.
There are a lot of variables that come into play with Rattlesnake Avoidance Training. Far too many to list. Therefore, we require our Lead Rattlesnake Avoidance Instructors to undergo a minimum of two years of training in order to properly read and adapt to all of the situations that can occur. “We’ve gone to Partners for 6 years for our annual snake proofing and they never fail to excel! The trainers are very nice and conscious of your dog’s quirks/issues, and ensure they pass the test. If they don’t pass, they get a redo in a week or so.” -Julie S.
We have your dog’s life in our hands, and we take that very seriously. That is why only the best of the best trainers are hand-picked to be a part of our Partners Snake Avoidance. These high standards are set to achieve the best results with your dog. 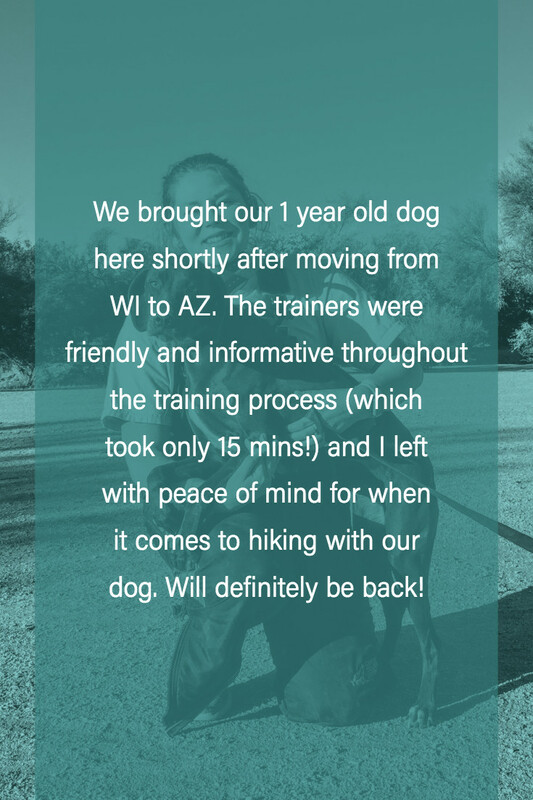 “Everyone we worked with was very professional, and you can tell they truly care about the well-being and safety of your dog. Within one, 20 minute training session, Sandy wouldn’t go near or look at the snakes (all in cages), even when I went over by the cage and called her name.” -Kimberly H.
Yes, we have found that it is the best way to get a negative association with the sent and sound of the rattlesnake. However, we ALWAYS start at the lowest level and use the minimum amount of energy necessary to get the desired result. The electric stim from the “e-collar” does not harm the dog in any way. Quite frankly, pain is a very poor way to train behavior as it tends to shut dogs down. We welcome our clients to test the “e-collar” on themselves, and we even test it on ourselves before every session. Yes! As long as it doesn’t distract them (or us) from the training. Obviously, your dog’s success is our primary goal, so that is what we will always put first. We do reserve the right to stop training at any time in the interest of your dog’s safety. why don't you use my leash? We use our own equipment in order to ensure that your dog doesn’t associate your leash and collar to the training. We want the training to be between the dog and the snake. Not anything else. Additionally, our equipment is designed to ensure your dog can’t escape which is possible with certain harnesses. Yes. Our rattlesnakes are live and intact, meaning we do not defang or milk them. We want to maintain the most natural scenario possible, and of course, we don’t want to harm or cause any undue stress on the snakes. However, our snakes are in double mesh wire cages so there is NO way they can get to your dog. Do we do the training? No. We will have our handlers run your dog through the course. This makes certain that the dog is focused on the training and not worrying about mom or dad. You could also potentially alert your dog to something without even realizing it. Your dog will react to this energy and training will be affected. Will it work for all snakes? Rattlesnake Avoidance Training will only work for live Rattlesnakes. The training is not guaranteed for other types of snakes or dead Rattlesnakes as they have a different association and won’t register for the dog. Rattlesnake Avoidance Training takes about 6-8 minutes. However, you should allow about 15-20 minutes in total to do the check-in, desensitization of equipment, training, and debrief. How many times do we need to train? We recommend refreshers every 6 months to 1 year. After your dog’s training session, the handlers will let you know what they recommend for your dog. Can the snakes bite my dog? Nope! The snakes are in a double wire mesh cage with about 3-4 inches between the inner cage and the outer cage. There is absolutely no way a snake could every bite your dog during training. Your dog should be at least 5 ½ months old for Rattlesnake Avoidance Training. We have found that dogs younger than that are generally not mature enough for training to be effective. Should my dog get the rattlesnake vaccine? Yes. The benefit to getting the Rattlesnake vaccine is it buys you more time to get to the vet if your dog is bitten. Always consult your veterinarian for eligibility.